Auburn Avenue is known around the world. It's home to many important churches. Big Bethel is one of them, an imposing granite landmark, pillar of the community for 164 years, home church to many Atlantans. This is where Morris Brown College began in 1881. That's just scratching the surface. 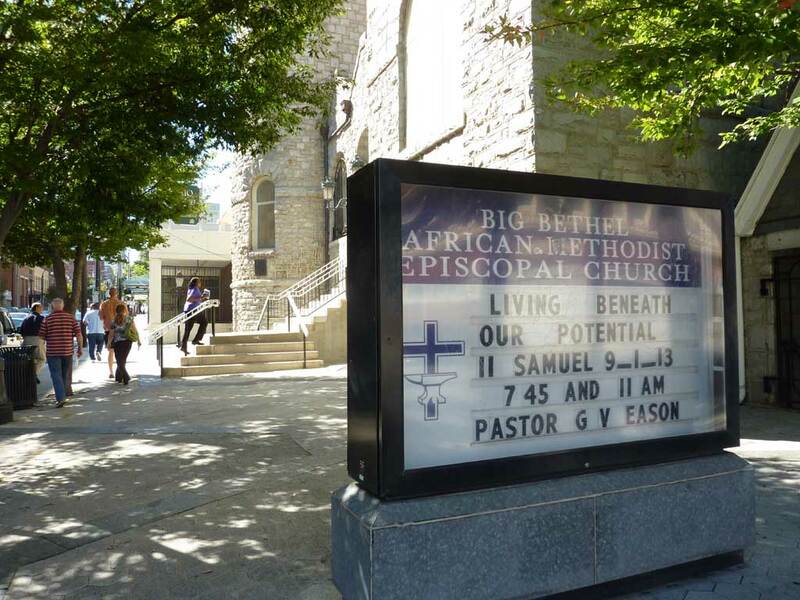 On Saturday afternoon I visited Big Bethel African Methodist Episcopal Church for the Atlanta Preservation Center's first "Sacred Spaces" tour. If you've visited the M.L. King Historic District, there is no missing it. You can even see it from the highway looking west from the I75-85 connector. The steeple has a lighted cross with "Jesus Saves" on it. "Big Bethel A. M. E. Church was founded in 1847, and is the oldest predominantly African American congregation in the Metropolitan Atlanta, Georgia area....The existing building was rebuilt in 1922, after being destroyed by fire in 1920 and erected with a lighted cross in the steeple with the message, "Jesus Saves." All walls, except the west wall (the wall next to the organ) are original. The stained glass windows in the balcony feature our founders, Bishop Richard Allen, Bishop Henry M. Turner and Bishop Joseph S. Flipper." It was time to see inside, but I wasn't ready for this. I needed a bigger camera, and a bigger heart. We gathered downstairs and toured in small groups. As we climbed the stairs, the windows hinted that we were on our way to something special. The sanctuary was filled with light. I couldn't imagine that we were inside a granite monument. We didn't have to imagine how the Möller Organ. We heard it for ourselves. The founders keep an eye on things from the balcony windows. Giant windows flank the chancel. I could touch the ceiling beams from the balcony. They are stamped metal. The detail shows through many coats of paint. They had pictures of nearly all of their pastors back to 1844 reminding us that it's the people not building. This is a 1926 recording of the Big Bethel choir. That's about halfway back to the founding. I began my Saturday at the Paces Ferry United Methodist Church for the Atlanta Preservation Center's first "Sacred Spaces" tour. Paces Ferry Road is home to the Governors Mansion and many of Atlanta finest homes. A church on "Paces" should be big. I guess this wasn't so in 1896. On a hilltop on Paces Ferry at Mr. Paron it remains a quiet place in the woods. It's a scene you might find anywhere in the Appalachian foothills. 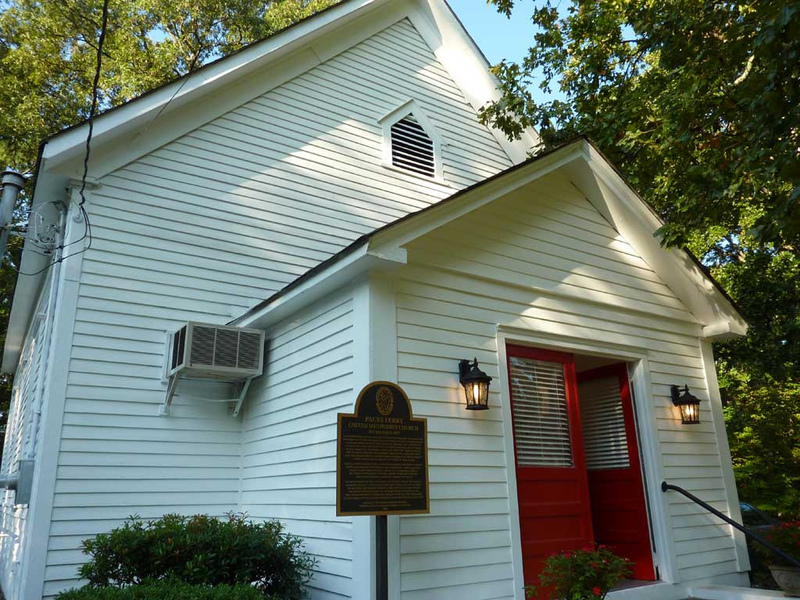 It shares the Architecture Tourist award for "Buckhead's small and lovable churches" with New Hope AME Church on Arden Road. It has never burned. They take extraordinary care with candles. A wedding party that insisted on candles hired a fire truck to stand by in the parking lot. I'm an architecture optimist: beauty doesn't require billions. If you build something beautiful and lovable, people will try to keep it forever. No surprises inside, exactly what we'd expect, exactly what we'd want. The Pleasant Hill Cemetery is older than the building, older than the congregation itself. Union soldiers remain buried here. Wm Brown donated the property to the church. You can unwind and remember on this hill. Thanks to lay minister, Steven Unti, Kristin Puckett, and to the Paces Ferry congregation for their hospitality. They'd be happy to see you on any Sunday. Your humble blogger is all tuckered out. I toured a giant synagogue, a tiny hill-top church, a granite landmark church on Auburn Avenue, and a granite landmark church on Peachtree. 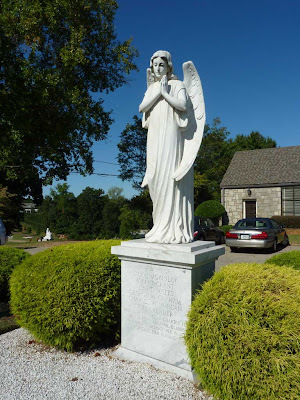 I hiked the sacred hills of a south Atlanta cemetery, Decatur, and Agnes Scott College. I regret missing the tour of Al Farooq Masjid, the towers on 14th street. Here is the Sacred Spaces brochure from the Atlanta Preservation Center. One of the angels at South-View Cemetery. Thanks Atlanta Preservation Center, to Brandy Morrison, the chief organizer, our event hosts and volunteers, to my fellow architecture tourists. Anyway, I'd like to blog everything but today I'll just link to my pictures. Paces Ferry United Methodist Church - Pictures. This my Flickr photo collection with all the pictures. Finally. After driving by for nearly 40 years, I got to see it. I was there for 2 1/2 hours. Though modern and minimal, I couldn't take it all in. I can only give you hints. The Atlanta Preservation Center's first "Sacred Spaces" tour started last night with Ahavath Achim Synagogue. There are more events Saturday and Sunday that cover the spectrum. It's easy and free. You need to R.S.V.P for a few of them. Andre Steiner designed Ahavath Achim Synagogue which was completed in 1958. Druid Hills folks know Andre Steiner from Briar Park Court. Perli Pelzig designed the stained glass windows and more, that's another story. These are the chapel windows. The chapel windows from inside. This is the view from the west parking lot. The small box is the chapel, the big box is the 2,500 seat sanctuary. The entrance to the chapel is straight ahead. We gathered in the lobby. Brandy Morrison who put the APC Sacred Spaces together and Tom Little, a leader of DOCOMOMO Georgia introduced the tour. Tom is the tall guy with glasses on the left. Historian and author Doris Goldstein gave us a little history and a tour of their beautiful museum. The sanctuary seats 2,500 and has room for 3,500 in a pinch. Big, warm, not intimidating, it's minimal with plenty to see. The windows are more folky than abstract and are loaded with symbolism. Each of the 28 windows in the sanctuary deserves a long look. Rabbi Neil Sandler made us feel at home as he introduced us to the congregation and symbolism. Architect, Stanley Daniels told us more about the structure. In 1958 the style for churches/synagogues was "awesome" (I'm using my own terms here). These days the style is "intimate." Mr. Daniels discussed how they might make this room a bit more intimate. However that turns out, I'm happy to see the awesome. Then the unexpected highlight: They opened the Aron Kodesh. It took a few folks to find the latch. These handmade objects broadcast life into the rather severe room. I was moved. We ended the evening with a film about Andre Steiner, "Andre's Lives." Here is Andrew Kohr introducing the film. That's another extraordinary story. After 2+ hours I was satisfied, exhausted, overwhelmed and grateful. I hope to return. Thanks to the Atlanta Preservation Center and to Ahavath Achim for this architecture tourist opportunity.